Ready for a new adventure? In this post we find out how to plan a paramotor camping trip, and how to carry all of your gear with you on your paramotor. Paramotor camping is becoming super popular among adventurous pilots looking for new challenges. Pilots can land in small clearings miles from the nearest roads, and reach places only dreamed of in the past. If you're a pilot looking for new adventures, then paramotor camping, also known as fly camping could be for you. Your first paramotor camping trip will take a fair bit of planning. 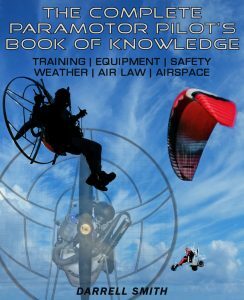 You'll need to make a list of everything you need, and figure out how to attach it to your paramotor. Do this before you even plan a date, and have it ready to go when the weather is right. You already know that paramotors aren't made for transporting anything much bigger than a wing bag, so you'll need to get a little creative. Taking a tent, sleeping bag, and air mattress may not be practical, but you can get some great all-in-one options. Something like the RhinoWolf all-in-one super tent is perfect, as it has the whole package and only weighs 2.5kg, but it is pricey. My brother recently bought a tiny tent which would work perfectly for fly-camping. It measures under 1.5 ft when packed away, which is much smaller than the tent I've safely strapped to my paramotor. It's also very light and under 2 kg. Here's a link to the tent on Amazon where you can read more and check the current price > ALPS Tiny Tent. If it's midsummer you may be able to leave the tent and sleeping bag, and just take a mattress and a tarp tent. This would easily fit in a harness or flight suit pocket! You may need to attach some of your gear to the bottom of the frame or harness, so you'll need a good way of securing it. Rope is my first choice, but use secure knots. You'll learn all of the knots you'll need here > Netknots. Ratchet straps are also good, but they'll add weight, and they're fairly chunky. The ratchets could also get in the way, or take up valuable space. When your gear is attached, be sure to tie up any loose rope/strap ends to prevent them getting sucked into the propeller. Think about how much fuel you'll need, and if you'll have to land to refuel. If you're planning on filling up at fuel stations along the way then don't forget your oil (2-stroke motors). Pour the right amount of oil into a small bottle, this is better than taking a whole 1 litre tub, as it leaves space for other things. Do a full check on every single nut and bolt before leaving, as a simple loose bolt could really spoil your trip. You'll want to take some tools, but choose wisely as you can't take your whole toolbox. Here's a list of tools that I always take flying to help you decide which ones are essential for your trip. Plan the landing zone well and always have a plan B, or backup landing spot. When you reach your destination don't just fly straight in and land. Circle over top, and look at the launch strip to make sure you'll be able to launch again. If it looks too tight then don't risk landing, use your backup spot. Pilots flying trikes will be able to carry more camping gear, but beware that this may lengthen your takeoff run. You'll need more speed and a longer strip to get airborne, so bare this in mind before landing. When you're ready to set a date for the trip, be sure to tell a friend exactly where you're going, and when you'll return. You should always have a backup plan for the worst case scenario, as things don't always go to plan. It's good to have some kind of plan in place just in case your motor quits, or won't start for the return trip. If it's fixable on site it's probably easier to leave your gear and walk to the nearest road, then come back with the necessary tools and parts. Walking long distances over rough terrain carrying a paramotor and wing isn't easy, I've been there! Or maybe the weather report was totally wrong and you can't safely launch to fly home. Get the weather reports for a few days ahead, as it's going to be easier to wait it out if possible. Again it's going to be easier to find a road on foot and leave your gear behind. Get the supplies you need and return to camp, and then wait for a break in the weather. Check out your planned camping spot on google maps, and figure out a way to get out on foot. Do this before leaving and plan a rendezvous point with a friend, if they get the signal from you. It's always best to stay within reach of a phone signal, so you can easily reach anybody for help. Imagine having a bad landing and breaking an ankle with no way to reach anybody. Always plan for the worst! Here's a list of the gear I took with me on my first two paramotor camping trips to the mountains. I decided to keep the trips to purely camping, so all I needed was a tent and some other essentials. Also, bare in mind that I only had to fly an hour each way, and only camped for one night. I took a two man tent and sleeping bag that I attached to the frame using lightweight rope. This was then pulled forward with a separate rope to prevent it swinging around into the propeller. I packed my wing compression sack just in case my engine quit, as I would have had to walk to the nearest road. This folded down enough to fit in a pocket of my flight suit. My left harness pocket held a spark plug and plug spanner, Allen key set, spanner set, knife, roll of wing repair tape, torch, and wire cutters. I also managed to fit a bottle of water and my fuel check mirror in there. I folded up an air mattress and carried it under the seat with a small pump. lastly I attached a small bag to the frame above my head with some food and another bottle of water. As on every flight, I also took my phone and my wallet for emergencies. I didn't pack much, but all of this along with a full tank of fuel felt super heavy! Standing up after strapping in was fairly difficult, any more weight would have been too much to handle. If I had another pilot with me I could have taken a little more, as they could of helped me to my feet. I plan on buying an all-in-one super tent for future fly camping adventures, they're pricey, but definitely worth it if you do this often. This will save on lots of space, and also keep the weight down. It's worth mentioning that in the past I've also flown with a rucksack. I wore the rucksack back to front and clipped into the harness as I normally would. This would be great for carrying a few extras for your trip. Some manufacturers also offer storage bags that fit directly onto their paramotors that would work great for paramotor camping. Some spots I've considered for paramotor camping are accessible by car or just a short trek from the road. If this is the case for you then you could have a can of fuel dropped off at your planned camping site. This way you could get a bit of sight seeing in the next morning, and enjoy some fun flying in a different location. 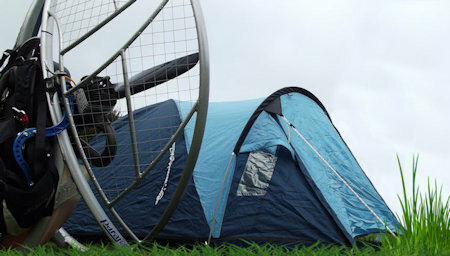 You should now have a good idea of how to arrange your paramotor camping trip. Staying safe during the flight with good planning, and by securely fixing any gear should be a priority. Don't rush it, plan well and always have a backup. If you're taking a lot of gear you may need to do a hang test before flying. You'll be surprised at how much difference a couple of extra kilos can make. For help with finding the correct hang point setting click HERE. 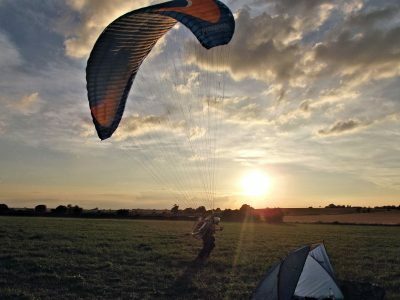 Enjoy your paramotor camping trip, any more tips to help other pilots can be shared in the comments below. If you like the sound of fly camping, you'll want to practice your cross country flying first, find out how HERE. I’ve been camping since I was an toddler and always preferred tents, sleeping bags, thermarest/air mattress, etc. However, my parents gave me a nylon hammock with no-see-um bug screen and rain tarp one Christmas. I’m curious to know if you have ever used one. We’re talking about the most comfortable sleep available anywhere and it weighs a few ounces and everything packs into something the size of your boot. 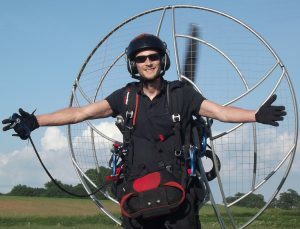 I’ll be in paramotor training this spring and plan on doing some overnight trips closeby when I get comfortable with flying. Anyway, checkout TrekLight Gear. It’s the real deal! Hi Merrick, I haven’t tried a hammock for paramotor camping, but it could definitely work. It wouldn’t be suitable every time as there’s not always something to attach to, but pilots landing near to trees could certainly save some space and weight by packing a hammock. Thanks for the input, and good luck with your training!